Easy Do it Yourself Palapa Kits! In the Backyard or Patio! They also give your backyard a tropical ambiance and flair. 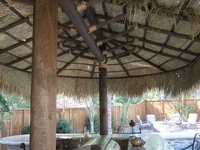 Not to mention, Palapa kits are great fun for sitting under and socializing with friends and family! Further below you can browse our fantastic range of Palapa Kits for sale. First though, here is some more information about Palapa kits. So Easy to Assemble for a Start! In most Palapa kit packages, you will receive hardware, pre cut lumber and thatch roofing materials. If you have a basic tool set, then you're all ready to go and start assembling your Palapa kit. Some of our Palapa kits below can include a 36" pinewood table as well if purchased. There are a couple of different options for placement of your Palapa kit in your backyard. Palapas can be placed in the soil by digging a 12-inch-round hole in the ground and using a three foot long PVC pipe 6" or 8" inside diameter and concrete PVC pipe two foot in ground and one foot out of ground. This will act as a sleeve for the main pole. Slide the main pole inside the PVC pipe and secure it with lag screws. Then rap the PVC pipe with 3/4 rope to hide the PVC pipe. 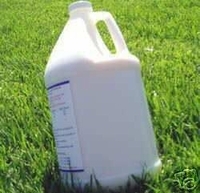 This will also help when hosing down the concrete deck. This can be done by renting a core machine from a Home Depot, Lowes or a rental company. We also sell steel Palapa Umbrella mounting stands that are powder coated black for $189.00 with Free Shipping. It comes with four red head concrete lags for securing to the concrete. When installing our palapa umbrella covers on your bbq island palapa structure make sure to completely rinse off the palapa cover prior to installation to remove any clay residue from staining counter tops. These are made in the villages in Mexico and are made by hand and are assembled on dirt. Sealing your complete bbq island is recommended. 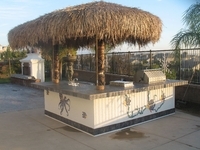 All tiki bar kits are made of pinewood poles and will crack and split this is the nature of this type of wood because it is a moist wood and will retain moisture and as it dries out it starts to crack and split no way to prevent this from happening. You can fill in cracks with gorilla wood glue if you like. Remarkable Strength, Durability and Appearance! Palapas are usually made out of fine, top notch pine wood, notably hand-picked lodge pine poles. Lodge pine poles are remarkable for their durability, strength and lovely appearance. Workers hand peel this wood by using two handled knives which remove the bark. The top part of the palapa is made out of natural Mexican Palm Thatching. We Supply to all the Big Names! Trust the same company that supplies Tahitian thatch, African thatch and bamboo items to Disney, Sea World, Raging Waters, Universal Pictures, Senor Frogs Hooters and so many more! *** 500,000+ SATISFIED CUSTOMERS *** → CAN'T be Wrong! 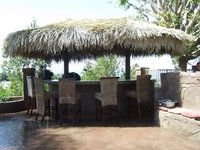 "Browse our Palapa Umbrella Kits Below"
As of April 1st all kits will ship in around 4-5 weeks. Prior to April 1st kits will take approximately 2-3 weeks. FREE SHIPPING IS FOR CURBSIDE DELIVERY ONLY. IF YOU NEED LIFT GATE OR INSIDE DELIVERY CHARGES APPLY AS FOLLOW. LIFT GATE $85.00, INSIDE DELIVERY $79.00. PLEASE REQUESTED WHEN ORDERING. 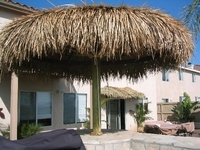 Palapa, referring to an open-sided dwelling with a thatched roof, is another name for umbrella. Palapa has one or two poles in the center, differing from a Tiki hut which has three to four posts. They provide shade and coolness in the summer as thatch Palapa is able to block both the sun and heat while the ordinary cloth umbrellas absorb the rays of the sun. Enjoy the look and feel of the islands in the privacy of your own back yard or patio by cooling yourself sitting under a thatched umbrella. You don't have to have a tropical theme or a house on the beach to incorporate thatch into your design plans. Using such a soft natural material as Palm thatch fits in with any theme. Palm thatch holds up against high winds and allows heat to flow up through its leaves. The effect it will have on your yard is relaxing, surrounded by beauty. By buying a Palapa umbrella kit, you will save hundreds of dollars by assembling it yourself rather than buying the pre-made umbrellas. The kit comes with everything pre-cut but the slats. It includes all the hardware, two thatch covers, pinewood poles and the center main pole with varying diameters and lengths to correspond to the size kit you have ordered, and detailed instructions, so you know exactly what to do. If you have a basic tool kit, then you are ready to assemble your Palapa umbrella with an average of two and a half hours of prep time, depending on the size. Smaller kits will take less time than the larger ones. 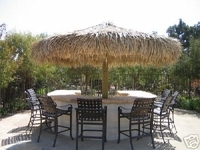 Some of the Palapa kits include a 36' round pinewood table for your Palapa umbrella. The table is made of the same pinewood the kits are made of to match perfectly with your lodge pine poles. It includes mounting brackets and will be bored with a 6' hole. The kits come with pinewood poles made of high-quality pinewood that is hand-picked. The lodge pine poles are noted for their durability, strength and unique appearance. The bark is removed by hand using two handled knives to strip the wood. Option #1 for placing it in soil would be to use a 3' length of PVC pipe with a 6" or 8" diameter and digging a 12" round hole in the ground placing 2ft in the ground and 1ft above ground and adding concrete. This is the sleeve for your main pole which you secure with lag screws. Option #2 is to purchase a Palapa umbrella mounting stand, powder coated black and featured free shipping. To secure to concrete, four red head concrete legs are included to complete your order. The base is 12"x12" square, and the pipe is 12" high and has a 6" inside diameter. When ordering your kit, consider the look you want and the space you are going to put it in for maximum comfort and aesthetic appeal. 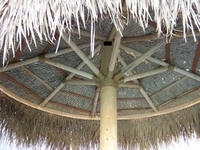 Featuring a custom-made frame with two thatch umbrella covers, the center main pole is a 6in diameter and 8ft in length designed for quick and easy assembly in about one and a half hours. These are the same frames and thatching you see on beaches and at resorts. We offer better prices and better products because we do all the work ourselves. No sub-contractors. This kit comes with detailed instructions, two thatch covers, all hardware, pinewood poles, wood slats, rope, and main center pole. Everything is pre-cut and drilled except for the slats. The center pole is a 6in diameter by 10ft lodge pine pole. Free shipping for curb side delivery. For a single pole Palapa umbrella kit, this is as big as they come. Featuring all the standard pieces as our other kits except for the center pole which is larger to hold the weight of the Palapa thatch. This lodgepole is 7in in diameter and 10ft in length. The kit will last many years and withstand 60-70 mph wind speeds. Rustic wood and pre-woven tops made in mainland Mexico are a feature of this kit. The 4 support poles have a distance of 6ft between them. The pre-woven tops make them especially durable. This beautifully styled two pole oval kit, with its rustic wood and pre-woven tops made in Mexico, is a study in beauty. Installation is as easy as digging or coring a hole, constructing the frame, and putting on the thatch covering. It features free nationwide shipping curbside. 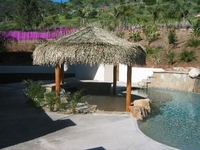 Transform your yard, patio, pool or commercial property with your 2-pole oval Palapa umbrella. Everything comes in the kit to assemble it easily and quickly, precut and predrilled, needing only your basic toolbox. All kits come with everything included to build your Palapa umbrella; precut and predrilled except for the slats, all hardware, two thatch covers, pinewood poles and, in the case of these kits, two center poles, the diameter, and length custom made for the size of the kit. 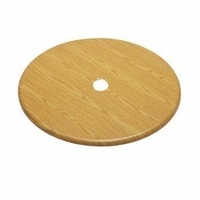 Other items you may be interested in include the 36in pinewood table for your umbrella, the Palapa umbrella mounting bracket, and our thatch sealer which adds longer life to your thatch material.